This smoothie was designed to refuel your body after an intense session of exercise. It’s important to consume protein within an hour after exercising to provide your body with the raw materials needed to recover and rebuild. Football practices are well under way across the country, hence the name of this smoothie, which is a great option after any sort of challenging workout, competition, or sport specific practice. While composing this recipe post I was reminded of the not so healthy milkshakes I use to drink after football practice as a youngster. Regular old store bought milk, vanilla ice cream, and chocolate syrup. If only I knew then what I know now. The base of this smoothie is raw milk, either cow or goat. You can substitute another liquid if you don’t have access. Raw milk has a long history of supporting health and building strong bodies. It contains all the nutrients, the way nature intended, necessary to replenish your body after a workout. I won’t get into the raw milk debate here, that’s for another day, but will offer this link for those unsure of the differences between regular, organic, and raw milk. On a personal note, I have been drinking raw cow and goat milk for over two years and absolutely love it! To see if raw milk is available around you, click here. The bulk of the protein in this smoothie comes from your protein supplement and raw milk. The other ingredients add a little protein, as do the optional add-ons: almond or peanut butter and chia or flax seeds. As is the case with any smoothie, tailor it to meet your health goals and nutritional needs. Bananas provide the signature smoothie thickness, are a great source of healthy carbohydrates, and help restore your body’s glycogen levels after exercising. Bananas are also a good source of potassium, one of the main minerals you lose while working out. A high quality sea salt also replenishes minerals and electrolytes lost during exercise. Rounding out the ingredients are coconut oil, which provides healthy fats, and cinnamon, for taste, anti-oxidant action, and inflammation reduction. My smoothie turned out quite thick, and chocolatey from chocolate Sun Warrior protein and cacao powder. Enjoy! 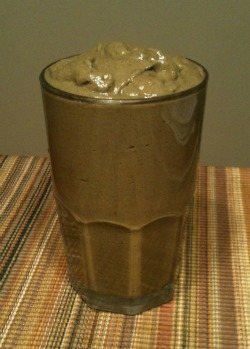 I’d love to hear what you think of this Post Football Practice smoothie, or if you try it out, in the comments below. Happy Blending!